Suicide Squad provides endless action and characters as the third installment in the DC Comics Extended Universe (DCEU) film series. But the filmmakers also have arranged the elements better for a more cohesive audience experience. The large cast of characters is set in an urban playground, which makes things challenging for filmmakers, but the movie’s simple and familiar format helps their efforts. Overall, however, the project needed more originality and creativity to really make it work. David Ayer (End of Watch, Fury, Harsh Times), who served in the U.S. Navy, is the perfect choice as director because most of his films involve anti-heroes…no shortage of those in this two-hour and three-minute ruckus romp as audiences have plenty to digest. This movie begins with the main subjects/characters at a “black site” in Louisiana then transitions to top authority action while constantly depending on associations to the DCEU, so expect several appearances from famous heroes as well as some not so famous characters. The story mentions several possibilities of expansions plus other “metahumans” and others “looking for them” as this special squad must content with threats from all sides. The high antagonist-to-anti-hero ratio provides fodder for their violent talents, while the core villains create an epic conditions set in Midway City (home of possible future DCEU series characters Hackman and Hawkgirl) where the anti-heroes must reach beyond themselves and anything they have previously known. This epic condition does not really draw the focus though as audiences must rely on the antagonist characters’ dialogue and unknown abilities as they are set in a violent, colorful playground. Strangely this main conflict does not create much mystery, drama or tension even with a key character connection. This self-proclaimed “suicide squad” gets a viable shot at some fresh air to “do some good” for U.S. military heads after people in power apply leverage and superior power over them as secret files abound and eventually expose true intentions. This feature film debut of the group follows their television appearances on Smallville and Arrow. Ayer wrote a formulaic screenplay that contains a prominent building reference to the comic book writer John Ostrander. The maximum security prison scenarios are familiar, but the characters are not. Will Smith headlines this crew as expert hitman Deadshot (a.k.a. Floyd Lawton) who takes an unexpected leader role after a life of taking orders. This role needed a big star because most audiences do not know this character very well. Smith handles his duties well and impresses with the typical action zingers and firearm skills that rival Keanu Reeves. 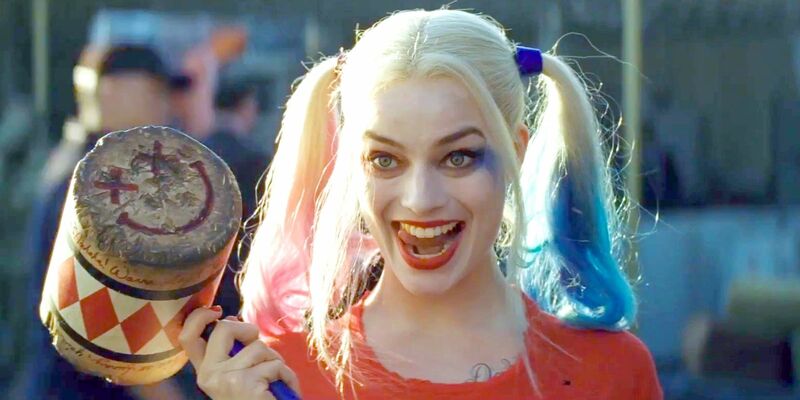 Margot Robbie is perfectly cast as Harley Quinn. She gets many memorable lines that equal her magnetic screen presence, but too many predictable ones (e.g. “killer app”, etc.). “Play with me,” she says as she baits her prison guards into making a move. Filmmakers get credit for displaying an impressive range that showcases Robbie and the female experience spectrum. Harley’s predictably ogled and objectified, but also respected and cared for. She also has an extensive history with The Joker, played by Jared Leto, who is Batman’s main nemesis. The filmmakers missed the opportunity to use Nolan’s considerable equity built in the DC universe, and instead offer a flashy, materialistic Joker who bores with philosophical mantras like desire to surrender then power. Leto and Robbie do what they can among the main storyline, but their potential is never fully realized as filmmakers basically set up their base relationship for the upcomingHarley Quinn film. Her new handler Amanda Waller played by Viola Davis (TV’s How to Get Away With Murder) describes her as the most “fearless“, which is why Harley reaches beyond the standard seduction, sneakiness, and savvy actions. Jay Hernandez (Friday Night Lights, Crazy/Beautiful) plays Diablo (a.k.a. Chato Santana) who has the most tortured past due to his special powers/talents and Adewale Akinnuoye-Agbaje (TV’s Lost, Oz) plays the amphibious creature Killer Croc who does not say much, but does plenty. Swedish actor Joel Kinnaman (Robocop, Run All Night) plays Rick Flag, a special-forces officer with a unique connection one of these anti-heroes who also leads this dangerous group into a mysterious situation. Flag’s team provides predictable comic fodder and expendable lives for this suicide squad while eventually revealing his true self right along with Waller after a sequence where a military group ignorant to the overall objective are tragically dispatched. This duo represents the “gray area” between good and evil very well. Characters can try to size up/define each other and call out certain actions. Filmmakers cover the emotional and intellectual depth that comes with making these decisions among law enforcement, civilians, family members, criminals, vigilantes, and other types that continually blur moral and ethical lines. Cara Delevingne (Paper Towns) plays June Moone, an archaeologist who plays a key role in the main storyline and Jai Courtney (A Good Day to Die Hard) plays Captain Boomerang, an Australian criminal who adds some charm and comic relief. Adam Beach (Smoke Signals, Flags of Our Fathers) plays Slipknot while the beautiful Karen Fukuhara plays Katana in her feature film debut. Ike Barinholtz (TV’s The Mindy Project) provides excellent comic relief as a prison guard with great zingers (e.g. browser history joke, etc.) with echoes of Bill Paxton’s goofy role in True Lies. The filmmakers could have made the story clearer (for example, Waller’s “halo” mention during a helicopter sequence) and done a better job of following through with many of the movie’s plot elements. For example, Deadshot mentions then jokes about his ex-wife’s boyfriend. Why not give him a surprise appearance near the end of the film while adding the possibility of future appearances. There are plenty of characters in Gotham to choose from to bolster an existing DC Comic storyline or create a new, related DCEU storyline. Ayer spends much time using action to build camaraderie among characters and their beliefs, true desires, justifications and judgment to develop the themes. “Criminals deserve no mercy!” says Katana yet this group experiences mercy from an unpredictable source. ”We’re all ugly on the inside” reinforces the overall theme while providing some additional comic relief entertainment at the same time. Ayer also incorporates several flashbacks (original and from previous DCEU material) plus a key flash forward. He might have, instead, been more creative with the storylines, filling them in with real drama, tension and surprise. For example, audiences might have benefitted from more details about an archeologist’s mysterious expedition, but her fate during that expedition becomes more important than character development and depth in the storytelling. Steven Price’s impressive musical score (using character dialogue for most titles) works well with emotional movements and displays the character action without sounding too heroic in tone with a great highlight when Deadshot impresses with his skills in a key battle sequence while the modern song selection showcases character action montages and interludes (e.g. the memorable “Come Baby Come”) among the action. By the end, Suicide Squad will please general audiences, but unfortunately suffers from the same creative lapses, familiar elements and clichéd sequences as Marvel’s Deadpool, missing the mark as a deeper, more extraordinary experience. Only a “need-to-know basis” quip seems to be missing from this plethora of remediated material. Suicide Squad is rated PG-13 for sequences of violence and action throughout, disturbing behavior, suggestive content and language. Be sure to stay during the ending credits for an extra scene.